To prevent folate deficiencies, many countries supplement various foodstuffs with folic acid. This compound is a synthetic oxidised folate that differs from naturally occurring reduced folates in its metabolism and uptake. Notably, safety reviews of folic acid supplementation have not considered interactions with gut bacteria. Here, we use the Caenorhabditis elegans – Escherichia coli animal– microbe model to examine a possible bacterial route for folic acid uptake. It has been assumed that supplements are taken up directly by the worm, especially because E. coli is unable to take up folates. However, E. coli, like many other bacteria, can transport the folate breakdown product, para-aminobenzoate-glutamate (PABA-glu), via AbgT and use it for bacterial folate synthesis. This pathway may impact host health because inhibition of bacterial folate synthesis increases C. elegans lifespan. Folic acid supplementation was found to rescue a C. elegans developmental folate-deficient mutant; however, a much higher concentration was required compared to folinic acid, a reduced folate. Unlike folinic acid, the effectiveness of folic acid supplementation was dependent on the E. coli gene, abgT, suggesting a bacterial route with PABA-glu uptake by E. coli as a first step. Surprisingly, we found up to 4% PABA-glu in folic acid preparations, including in a commercial supplement. Via breakdown to PABA-glu, folic acid increases E. coli folate synthesis. This pathway restores folate synthesis in a bacterial mutant defective in PABA synthesis, reversing the ability of this mutant to increase C. elegans lifespan. Folic acid supplementation in C. elegans occurs chiefly indirectly via bacterial uptake of breakdown products via E. coli AbgT, and can impact C. elegans development and longevity. Examining how folic acid supplementation affects bacterial folate synthesis in the human gut may help us to better understand the safety of folic acid supplementation. The folate cycle involves a series of essential biosynthetic reactions known as one-carbon metabolism . Folates are a family of molecules composed of three common elements: a central aromatic core derived from para-amino benzoic acid (PABA), a pterin ring that can be modified and a chain of one or more glutamates . At each step of the folate cycle, an enzyme mediates a modification of the pterin ring of the bound folate, allowing the transfer of a chemical group containing one carbon atom (methyl, formyl, etc.) to or from the compound being synthesised . This cofactor role results in folate molecules being recycled and thus they are only required in very small amounts. Animals cannot synthesise folates and must acquire them from their diet or gut microbes. When these sources are insufficient, folate deficiency can lead to neural tube defects during human embryonic development . The rate of these defects can be lowered by preconception supplementation with folic acid, an oxidised form of folate not found in nature. Mandatory fortification of flour with folic acid has successfully decreased the incidence of birth defects in many countries, including the US and Canada . However, there are concerns that folic acid supplementation may have adverse effects on health, especially in older people [4–7], and there are many unknowns about the efficacy of uptake and biological utilisation of folic acid . Despite these uncertainties, recent reviews of the evidence by experts acting for government public health bodies have concluded that the risks are minimal and have recommended the fortification of flour or other food products as a beneficial intervention [3, 9, 10]. None of the above safety reviews mention potential interactions with gut bacteria. Bacteria also require folates for biosynthesis. Many make their own folates, but folates can also be taken up from the environment. Little is known about how bacterial folate biochemistry affects the host. Inhibiting Escherichia coli folate biosynthesis, either by treatment with the drug sulfamethoxazole (SMX) or mutation of the PABA synthesis pathway (e.g., a pabA or pabB mutant), extends the lifespan of the nematode Caenorhabditis elegans that feeds on it [11–13]. While these interventions decrease the folate levels in both E. coli and C. elegans, there remains sufficient folate available to support normal growth of both organisms . We have suggested that bacterial folate, at higher levels than need for growth, enables a bacterial activity that shortens the life of C. elegans and is independent of the folate status of C. elegans . Thus, the folate status of gut bacteria may be important for host health. To understand the interaction between bacterial and animal folates, we have developed a C. elegans folate deficiency model, a mutant in gcp-2.1 and homologue of human GCPII, which is required for uptake of dietary polyglutamated folates . The only way we have found of decreasing C. elegans folate enough to slow growth is by raising the C. elegans gcp-2.1 mutant on SMX-treated E. coli. Under these conditions, worms show delayed development and infertility . This phenotype can be prevented with 1–10 μM folinic acid, a reduced folate which can be absorbed directly by C. elegans, demonstrating that this defect is due to folate deficiency. In contrast, prevention with folic acid requires much higher concentrations (100 μM) . We also discovered that, at high concentrations, folic acid can partially reverse the lifespan increase caused by inhibiting E. coli folate synthesis . A possible explanation for this result might be the restoration of E. coli folate levels, but that would be a surprising conclusion because E. coli does not possess a folate transporter [14, 15]. However, it is known that E. coli can take up the folic acid breakdown product PABA-glu through the transporter AbgT and catabolise it to PABA . PABA can also diffuse across E. coli membranes. Increases in bacterial PABA levels from either source can be used to synthesise folate. In this study, we examine whether these routes might explain the lifespan effects of folic acid. Here, we use a system in which the external media, microbe and animal can be carefully controlled, to ask whether folic acid is taken up directly by C. elegans or uptake of folic acid breakdown products by E. coli represents an important alternative route (Fig. 1). We show that the prevention of developmental defects of the C. elegans folate deficiency model by adding folic acid depends on the E. coli AbgT transporter, demonstrating that bacterial uptake is the major route of supplementation. Consistent with this route, we show folic acid increases E. coli folate levels through a pathway that involves uptake of PABA-glu by the AbgT transporter and that PABA-glu is present in folic acid preparations. We also find that this pathway can reverse the lifespan increase caused by inhibiting E. coli folate synthesis. In summary, we have uncovered an unappreciated breakdown product in folic acid supplements and a bacterial route of uptake that can increase host folate levels indirectly but might also increase bacterial toxicity, accelerating ageing. In order to examine if E. coli is required for folic acid to prevent developmental defects in our C. elegans folate deficiency model, we tested whether the E. coli abgT genotype influenced the outcome of supplementation. Our folate deficiency model  is based on the measurable growth defect of the C. elegans gcp-2.1(ok1004) mutant during larval development, when it is grown on OP50 E. coli treated with 128 μg/mL SMX (Fig. 2a). In this study, we found a similar growth phenotype (Fig. 2a) when we grew this C. elegans mutant on an E. coli ΔpabA mutant (which cannot make its own folate because it cannot make the folate precursor PABA). To eliminate exogenous PABA, we grew the bacteria on a defined media (DM) containing only amino acids, salts, cholesterol and trace metals . Mutation of E. coli abgT alone did not influence the growth of the C. elegans gcp-2.1 mutant (Fig. 2a), because de novo folate synthesis is unaffected by the ΔabgT mutant. To examine the role of AbgT in the absence of endogenous folate synthesis, an E. coli ΔabgT ΔpabA double mutant strain was constructed. Developmental growth of C. elegans gcp-2.1 mutants on the ΔabgT ΔpabA E. coli was delayed just as it was on the ΔpabA mutant. In response to folic acid supplementation over a 100-fold concentration range, a dose-dependent increase in body length was observed for gcp-2.1 mutants on the E. coli ΔpabA mutant, which was not observed on the ΔabgT ΔpabA mutant (Fig. 2bi, asterisks indicate significant difference between ΔpabA and ΔabgT ΔpabA). In contrast to the 200 μM folic acid required to completely rescue growth of the gcp-2.1 mutant worms on E. coli ΔpabA and ΔabgT ΔpabA, only 1 μM folinic acid was required, and supplementation was independent of E. coli genotype (Fig. 2bii), consistent with a direct route to the worm for folinic acid. Overexpression of abgT in the E. coli ΔpabA mutant (ΔpabA (abgT OE)) increased gcp-2.1 mutant body length at lower concentrations of folic acid, with a complete rescue achieved at 100 μM folic acid (Fig. 2ci). Consistent with the previous experiment, folinic acid rescued gcp-2.1 mutant growth at a 100-fold lower concentration and independently of abgT expression (Fig. 2cii). Analysing the experiment by two-way ANOVA, we find that there is a significant interaction effect of abgT genotype (F = 102.67, p < 0.0001) and folic acid concentration (F = 123.55, p < 0.0001) on C. elegans gcp-2.1 body length (Fig. 2ci). These results are consistent with folinic acid being taken up directly by the worm , and the major route of folic acid uptake requiring E. coli and the E. coli AbgT transporter. As AbgT is known to transport the folate breakdown product PABA-glu, the results above suggest that PABA-glu is available to E. coli following folic acid supplementation. To test this assertion, we conducted growth experiments using the E. coli ΔpabA mutant under conditions in which there was insufficient exogenous PABA available to support growth, namely growth on DM agar plates when seeded after several generations of growth in liquid DM. We assessed how the growth of the ΔpabA, ΔabgT ΔpabA and ΔpabA (abgT OE) strains could be restored with folic acid, PABA-glu or PABA when added to the media. We found that the growth restored by folic acid or PABA-glu depended on abgT expression; 10 μM folic acid rescued the growth of the ΔpabA mutant, whereas 100 μM was needed to achieve an equivalent rescue in the ΔabgT ΔpabA double mutant (Fig. 3). In the presence of 10 μM folic acid, growth of the ΔpabA strain over-expressing AbgT was greater than that of the ΔpabA mutant alone. Supplementation by PABA-glu had a similar effect to folic acid but at a 10-fold lower concentration (Fig. 3), consistent with results of experiments in liquid at 37 °C . PABA, which can diffuse across biological membranes , rescued bacterial growth at nanomolar concentrations independently of abgT expression (Fig. 3). Overall, restoration of bacterial growth by folic acid can be largely explained by PABA-glu uptake by AbgT, while low concentrations of PABA present in folic acid preparations may explain the ability of high concentrations of folic acid to rescue the growth of the E. coli ΔabgT ΔpabA double mutant. In order to verify that E. coli growth following folic acid supplementation is attributable to restored bacterial folate synthesis, we used LC-MS/MS (see Methods) to detect levels of individual E. coli tetrahydrofolates (THFs) under the conditions used in the above experiment. 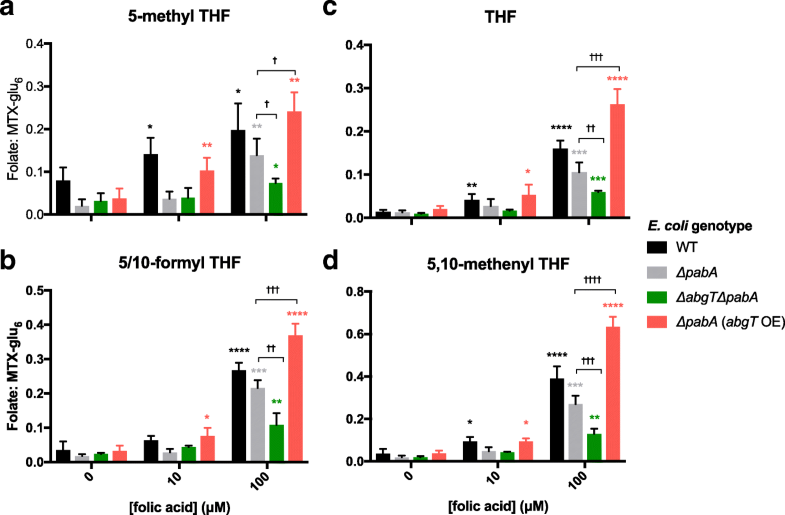 Levels of the most detectable, and thus likely most abundant, THF species (5-methyl THF-glu3, 5/10-formyl THF-glu3, THF-glu3 and 5,10-methenyl THF-glu3) are presented in Fig. 4. With supplementation of 10 μM folic acid, folate levels in ΔpabA and ΔabgT ΔpabA were not significantly increased compared to their non-supplemented controls. In contrast, in wild-type (WT) and ΔpabA (abgT OE) strains, addition of 10 μM folic acid resulted in significantly higher levels of folates. In response to 100 μM folic acid, folate levels increased in all strains compared to their non-supplemented controls, where the scale of increase was dependent on abgT expression (Fig. 4). At 100 μM folic acid, folate levels were highest in ΔpabA (abgT OE) followed by WT, ΔpabA, and finally lowest in the ΔabgT ΔpabA double mutant (Fig. 4). The abgT genotype had a strong effect on the folate levels of the ΔpabA strains at 100 μM folic acid (Fig. 4, pair-wise comparisons between ΔpabA and the ΔabgT ΔpabA and ΔpabA (abgT OE) strains are indicated by crosses). In summary, folic acid supplementation was found to increase E. coli folate levels in an abgT-dependent mechanism. Together, the data presented here indicate that the main route of C. elegans folic acid supplementation is indirect via E. coli uptake of PABA-glu and PABA. We used LC-MS/MS to test for the presence of these breakdown products in folic acid preparations from Schircks (used in all other experiments in this study), Sigma Aldrich, and Boots, a UK retailer of supplements. We also tested for further folic acid breakdown under the experimental conditions used here by analysing extracts from agar media supplemented with Schircks folic acid and incubated at 25 °C for 4 days. We detected PABA-glu in all three folic acid sources at between 0.3% (Schircks) and 4% (Boots, Fig. 5). Under the conditions used for C. elegans experiments, PABA-glu increased to 1.18%, suggesting further breakdown. PABA was found at between 0.01% (Schircks) and 0.06% (Boots, Fig. 5); this level of PABA in folic acid preparations may explain why folic acid can increase folates in a ΔabgT ΔpabA double mutant. Inhibiting bacterial folate synthesis, without affecting bacterial growth, is known to increase C. elegans lifespan [12, 13]. It was therefore hypothesized that, if folic acid increased bacterial folate synthesis, it may shorten C. elegans lifespan under conditions where bacterial folate synthesis was inhibited. Consistent with our previous findings , we find that C. elegans maintained on any E. coli ΔpabA mutant are long-lived compared to C. elegans fed WT E. coli (Fig. 6, Additional file 1: Table S1), whereas the ΔabgT mutation alone had no impact on C. elegans lifespan (p = 0.4312, Additional file 2: Figure S1b). Further, 10 μM folic acid was found to decrease C. elegans lifespan on ΔpabA E. coli by 9.4% (p = 0.0052), and to decrease it even further on ΔpabA E. coli over-expressing abgT (by 16.3%, p < 0.0001, Fig. 6a), whereas it had no effect on lifespan on the ΔabgT ΔpabA double mutant (p = 0.1901, Fig. 6a). In contrast, 100 μM folic acid decreased the lifespan on ΔpabA E. coli by 23.9% (p < 0.0001), whereas this concentration only shortened the lifespan on the ΔabgT ΔpabA double mutant by 4.7% (p = 0.0467, Fig. 6a). Lifespans on media supplemented with PABA-glu showed an abgT-dependent response similar to that observed with folic acid supplementation, but at a 10-fold lower concentration (Fig. 6b). In contrast, PABA supplementation shortened C. elegans lifespan in all cases independently of abgT expression (Fig. 6c), consistent with the ability of PABA to rescue E. coli folate production in a ΔabgT ΔpabA double mutant. Together, these results suggest that folic acid shortens C. elegans lifespan on folate-depleted E. coli via AbgT-dependent uptake of PABA-glu. In this study we have found that a major route of uptake for the synthetic supplement folic acid by C. elegans is via E. coli rather than directly via the worm. Why is folic acid not taken up directly by C. elegans with the same affinity as folinic acid? One possible explanation is that FOLT-1, the only characterised C. elegans folate transporter, is a reduced folate carrier with specificity for folinic acid . In humans, folic acid is also taken up in a different manner to natural reduced folates, with the major route thought to be via the protein-coupled folate transporter in the small intestine . A C. elegans PCFT homologue has been identified, but its affinity for folic acid has not been characterized . In addition, a homologue of the human folate receptor has been characterised in C. elegans . This study does not rule out that direct routes for folic acid exist in C. elegans, but indicates that they are inferior to the E. coli route. We have found that E. coli uptake of folic acid is dependent on its spontaneous breakdown into PABA-glu, which can be taken up by the E. coli PABA-glu transporter, AbgT. This transporter, which as far as we know is the only E. coli transporter for PABA-glu, has evolved to salvage PABA-glu from the breakdown of natural folates, and is found in many bacteria in the human gut microbiota . To our knowledge, this is the first study to show that this bacterial gene, and its level of expression, can influence the biology of the host, both by providing a route for folic acid to prevent host folate deficiency (Fig. 2), but also because it can lead folic acid to shorten the C. elegans lifespan when worms are cultured on folate-depleted E. coli (Fig. 6). The increase in folate synthesis caused by folic acid supplementation leads to a bacterial activity/toxicity that is harmful to the worm over the long term  (Fig. 7). It is possible that this bacterial route for folic acid exists in humans. As far as we are aware, no other studies have tested folic acid supplements for the presence of PABA-glu or PABA, but several studies have reported issues with the stability and dissolution of commercial folic acid supplements [23, 24]. In light of these issues, manufacturers have adopted a policy of ‘overages’ in order to ensure sufficient folic acid is released in the small intestine following ingestion . 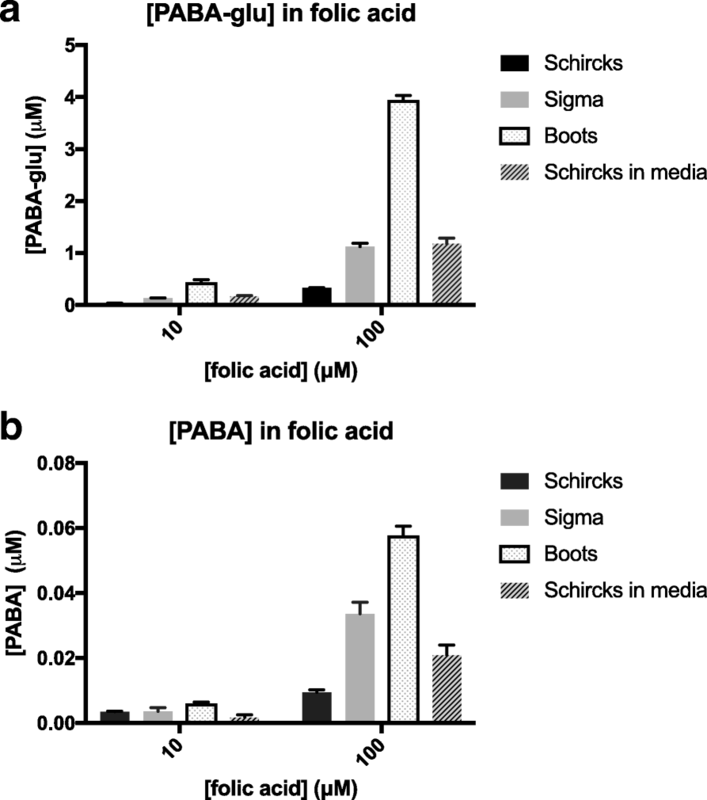 The presence of PABA-glu and PABA in a commercially available folic acid source (Fig. 6), combined with the instability of folic acid at the low pH conditions of the stomach [26–28], makes it likely that PABA-glu and PABA will be available to the gut microbiota following supplementation. PABA has been identified as a human faecal excretory product after ingestion of folic acid . Furthermore, studies in rodents  and piglets  have demonstrated that infusion of labelled PABA into the cecum results in the incorporation of bacterially synthesized folate in host tissues. Thus, the literature suggests that the components for such a route exist in humans, but the importance of this route is yet to be determined. We detected this route in C. elegans because of the poor bioavailability of folic acid in our folate deficiency model. Folic acid is taken up well by humans and leads to increases in serum folate levels, but circulating folic acid is often found to have retained its oxidised form, suggesting that it is not always bioavailable even when absorbed by the host [3, 8, 32]. The bacterial route increases bioavailability. Further studies are required in order to determine whether folic acid supplementation affects the folate status of human gut microbes and whether this in turn impacts host health. Interestingly, there are several diseases associated with an increased abundance of folate-synthesizing gut bacteria, such as inflammatory bowel disease  and small intestinal bacterial overgrowth , but a causal relationship between bacterial folate and disease has not been established. The abgT gene is found in the genomes of several enteric pathogens, including Enterobacter cloacae, Neisseria gonorrhoeae, Salmonella enterica, Shigella boydii and Staphylococcus aureus, in addition to E. coli. Whilst there is much consideration about the consequences of folic acid supplementation [3, 9, 10], our work here indicates that folic acid supplement instability and bacterial metabolism are previously unexplored variables that may impact human health and thus warrant consideration in future reports and studies. The main route of uptake of the synthetic supplement folic acid by C. elegans is via E. coli, with a dependence on breakdown of folic acid. Folic acid supplements contain breakdown products, raising the possibility that this route could occur in humans. This route shortens the lifespan of C. elegans on folate-depleted E. coli, suggesting that there are circumstances in which this bacterial route could have negative consequences for human health. Folic acid, folinic acid, PABA-Glu, 5-formylTHF-Glu3, 5-methylTHF-Glu3 and methotrexate-Glu6 were obtained from Schircks, Switzerland. PABA, vitamin B12 and folic acid were purchased from Sigma Aldrich and folic acid supplement from Boots, UK. DM was prepared as previously described , except that 10 nM vitamin B12 was added. Vitamin B12, folic acid and antibiotics were added post-autoclaving for agar plates. DM for liquid culture was filter sterilised. Following addition of 0.1 μM PABA to the liquid DM media, this was used to seed the plates in order to maintain bacterial growth (apart from growth experiments in Fig. 2). Then, 30 μL of 3 mL fresh overnight LB culture were used to inoculate 5 mL of DM (in 15 mL Falcon tubes). Kanamycin (25 μg/mL and 50 μg/mL of ampicillin if necessary) were added to both LB and DM pre-incubation. DM liquid cultures were incubated for 18 h at 37 °C and 220 RPM. All strains were derived from the Keio collection  (Table 1). The ΔabgT ΔpabA double mutant was made using the P1 transduction protocol as described in . The abgT over-expression plasmid (pJ128)  and empty vector (puc19)  were transformed into appropriate strains. SS104 glp-4(bn2), UF208 (WT) and UF209 gcp-2.1(ok1004) . E. coli was prepared as follows for all E. coli and C. elegans experiments. A 30 μL aliquot of an overnight LB culture of E. coli was transferred into 5 mL of DM and incubated for 18 h at 37 °C and 220 RPM. Then, 100 μL of the DM culture was seeded onto DM agar plates and incubated at 25 °C for 4 days. E. coli was removed by pipetting 1 mL of M9 medium onto the plate and a glass spreader was used to scrape off the bacterial lawn. The bacterial suspension was pipetted into a 1.5 mL Eppendorf and the volume was recorded (v). Tubes were vortexed vigorously to obtain a homogenised solution. Finally, 100 μL were taken and diluted with 900 μL of M9 in a cuvette. A spectrophotometer was used to read bacterial growth at 600 nm. Bacterial growth was calculated by multiplying OD600 by the volume of the sample (v). Bacterial lawns were scraped from plates into microcentrifuge tubes using M9 solution and kept on ice. Volume (v) multiplied by the OD600 of the solution (diluted 1:5) gives a measure of the amount of material. Samples were concentrated in a cooled microcentrifuge and pellets were snap frozen in liquid nitrogen. Pellets were thawed and resuspended in a volume of ice-cold 90% methanol: 10% folate extraction buffer (FEB: 50 mM HEPES, 50 mM CHES, 0.5% w/v ascorbic acid, 0.2 M DTT, pH 7.85 with NaOH) in proportion to bacterial content (37.5 × OD600 × v). FEB was spiked with 10 nM methotrexate-Glu6 as an internal standard. Samples were vortexed vigorously and left on ice for 15 min before centrifugation in a cooled microcentrifuge for 15 min at full speed. Supernatants were used for analysis. Folates were detected by multiple reaction monitoring (MRM) analysis using a SCIEX QTRAP 6500 instrument. MRM conditions for folic acid, PABA, PABA-Glu, 5-Me-H4PteGlu3 (5-methylTHF-Glu3) and 5/10-CHO-H4PteGlu3 (formyl THF3) were optimised by infusion of standards into the instrument. The optimised conditions for –Glu3 folates were applied to other higher folates using MRM transitions as described by Lu et al. . Further confirmation of identity for folates of interest was achieved by performing enhanced product ion scans and comparing the fragment spectra with known standards. The QTRAP 6500 was operated in ESI+ mode and was interfaced with a Shimadzu Nexera UHPLC system. Samples were separated using a Thermo PA2 C18 column (2.2 μm, 2.1 × 100 mm) with a gradient of 0.1% formic acid in water (mobile phase A) and acetonitrile (mobile phase B). Samples were maintained at 4 °C and 2 μL aliquots were injected. The column was maintained at 40 °C with a flow rate of 200 μL/min, starting at 2% B, held for 2 min, with a linear gradient to 100% B at 7 min, held for 1 min, before a 7 min re-equilibration step at 2% B necessary for consistent retention times. The column eluate flow to the MS was controlled via the QTRAP switching valve, allowing analysis between 4 and 8 min to minimise instrument contamination. Folates were quantified with reference to external standards and matrix effects were assessed by spiking of standards into extracted samples. Survival analyses were performed as described . glp-4(bn2) worms were maintained at 15 °C and shifted to 25 °C at the L3 stage. At the L4/young adult stage, animals were placed on bacteria under the experimental conditions. All lifespan data is provided in Additional file 1: Table S1. Statistical significance was determined using Log Rank and Wilcoxon tests of the Kaplan–Meier survival model. We thank the C. elegans Genetics Center, the C. elegans Knockout Consortium, and NBRP-E. coli at NIG for strains and we thank Sushmita Maitra and John Mathers for useful comments on the manuscript. This work was supported by the Biotechnology and Biological Sciences Research Council (BBSRC) (grant number BB/J014516/1). Data corresponding to all lifespan analyses can be found in Additional file 1: Table S1. Data corresponding to LC-MS/MS measurements of folate levels (Fig. 4) and folic acid breakdown (Fig. 5) can be found in Additional file 3: Table S2 and Additional file 4: Table S3, respectively. Conceptualization: CM, DW. Methodology: CM, DW, IC. Investigation: CM, IC. Data curation: CM, IC. Writing: CM, DW, IC, JG. Supervision: DW. Funding acquisition: DW. All authors read and approved the final manuscript. Green J, Matthews R. 2007. Folate Biosynthesis, Reduction, and Polyglutamylation and the Interconversion of Folate Derivatives, EcoSal Plus. 2007; https://doi.org/10.1128/ecosalplus.3.6.3.6. Public Health England. Folic acid: updated SACN recommendations. 2017. Retrieved 25 May 2018. https://assets.publishing.service.gov.uk/government/uploads/system/uploads/attachment_data/file/637111/SACN_Update_on_folic_acid.pdf.